This one’s for all you chocolate lovers! My nutty chocolate overnight oats recipe combines oats with cashews, chia seeds, and coconut for a filling breakfast that you can make in less than five minutes. Oatmeal is one of my favorite breakfasts. It can function as a simple base for a whole range of toppings and mix-ins, all of which can be thrown together in just a few minutes. In addition to the deliciousness and convenience factor, oats are packed full of health benefits. Oats are whole grain and an excellent source of soluble fiber and antioxidants. 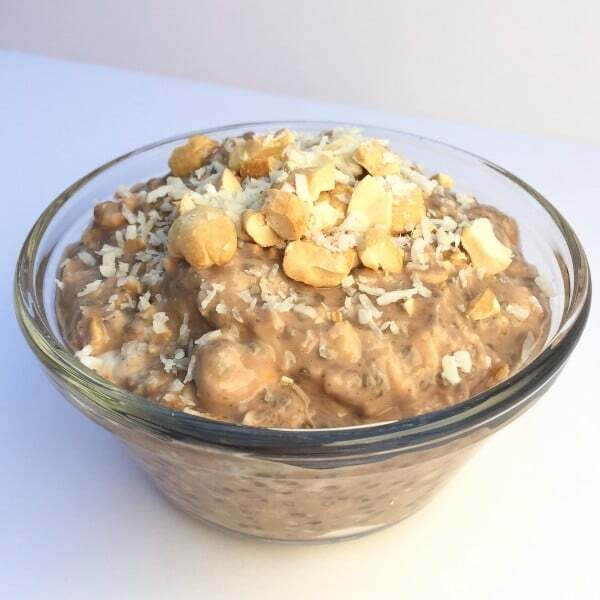 Consumption of oats has been linked to a lower risk of many diseases including diabetes, heart disease, high cholesterol, and certain cancers. All varieties of oats have a similar nutrition profile since they all come from oat groats. 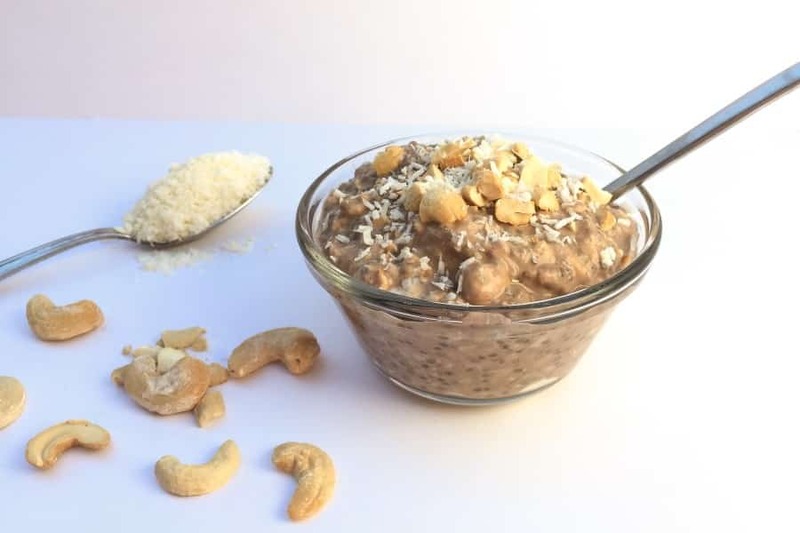 But since instant and quick cooking oats are more broken down, they have a higher glycemic index and are digested faster than rolled or steel cut oats. In addition, instant oatmeal varieties often have added sugars or sweeteners. This year I’ve ditched my bowl of hot oatmeal and turning to chilled overnight oats. You get all the deliciousness of oatmeal, without ever having to turn on the stove. Bonus: you put it together the night before, allowing you to have a nutritious breakfast without spending too much time in the kitchen come morning. The oats absorb the liquid you mix them with, and by morning soften into a tasty, pudding-like dish. Rolled oats work best in overnight oats. I’ve been playing around with different mix-ins since I first started making overnight oats, but this variation is one of my new favorites. It came about by accident: I was out of a few ingredients that I always toss into my oats, so I scoured my kitchen cabinets for alternatives. The result was a little bit of an “everything but the kitchen sink” mixture, and oh so good. Creamy and crunchy at the same time, with enough protein and fiber to keep me full during a 6-hour plane ride to LA (shout out to the TSA for letting me through security with my tupperware full of oats!). Chia seeds helped to give it a thicker texture, and peanut butter and plain 2% Greek yogurt added some fat and creaminess, while nuts and shredded coconut add crunch. Add all ingredients to a bowl, and stir well until completely mixed. In the morning, top with fresh fruit (bananas go well with this flavor combo) or some extra nuts and coconut. What food/drink do you recommend to take during a marathon and what is a good amount to eat throughout the run? Is “Generation U-Can” a good option? Great question — I work with a lot of people training for endurance events like marathons, nutrition make or break your race! Generation U-Can does have some great products, and I do recommend many of them. I don’t provide individual recommendations on my blog outside of a personal consultation, so please contact me if it is something you’d like to discuss further – alissa@alissarumsey.com. Thanks!